Tradeloop's Member Blog And News: iWant To Win An iPad - Don't You? 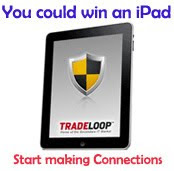 Time is running out to win a free iPad from Tradeloop. Any Tradeloop member or registered user who makes at least 10 approved Connections is automatically entered in the drawing. One lucky person will get an early present from Tradeloop. There are no forms to fill out, no purchase necessary, and nothing to mail. Anyone with ten approved Connections is automatically entered in the drawing. Learn more at our official iPad Contest page or go directly to the Dealer Directory and start making Connections. Do it today: there's not much time left!